I could not stop weeping at the new production of Fiddler. My tears began as the orchestra’s first slam-bangs heralded the opening number, “Tradition,” as the chorus slowly entered to bellow the word in unison. In this staging of the musical, which opened December 20 at the Broadway Theatre, the rugged, ragged Anatevkaniks make their first appearance from a lift at the rear of the stage, appearing before our eyes as if emerging from the depths of our memory, or of Tevye’s. The new staging is not revelatory. But it tells the classic tale faithfully and well, and is rich with pathos; my tears came sometimes from unusual provocations. When the Russians joined in “To Life” with an ebullience that was almost threatening—tears. When Danny Burstein as Tevye, Sholem Aleichem’s legendary dairyman, exploded from the strangely cool, slow burn in which he spent most of the first act, roaring his devastating “No!” at his wayward daughter Chava—tears streamed like the Volga. When Chava said of the engaged tailor Motel’s newly purchased cylinder hat, “It’s beautiful”—yes, then, too. My eyes disobeyed the badkhn’s “But enough tears!” in the wedding scene. I do not know precisely why. I once played Tevye, as a beardless youth in high school. It was partly the calling-back of those bittersweet recollections, and memories of my grandmother—of her dear face in the crowd for each of our performances—who passed away in September. But it was also this: as I watched, I heard the masses of people around me reliving Fiddler or introducing it to their children—humming along with the melodies, finishing lines for the actors, “ooh”ing and “ahh”ing and “oy”ing in alternating rapture and rakhmones. 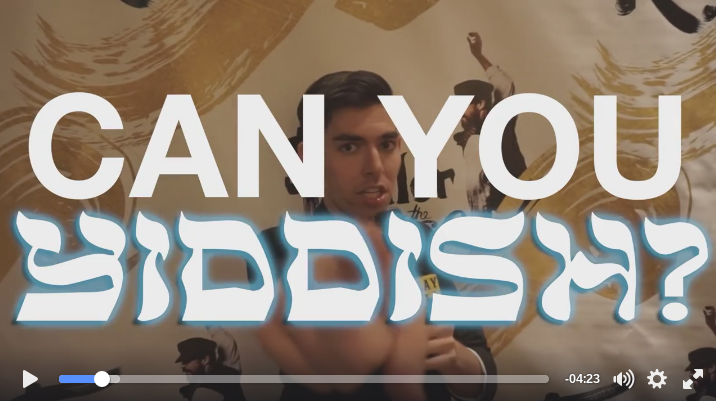 Fiddler is a part of their language. It is also—strangely but truly—for many Jews and Gentiles alike, a primary model of who and what is the Jewish People. I felt a curious contentment in realizing it. Of course there is trouble in reducing a millennia-old living civilization to the songs and banter of a few stage types, and the world would benefit by the creation, rediscovery, and performance of theater pieces that tell, with as much feeling and artfulness, the story of the Sephardim, the Mizrachim, the Bene Israel of India. But for now we have Fiddler, the fifth (!) Broadway revival. Though its actors are only playing parts, their ubiquitous show has played a part in fashioning an American image of the Jews. If the shtetl Jews and their descendants are to be represented by one stage spectacle, then es ken zayn erger, it could be worse, than the ceaselessly astounding Fiddler, in which the kerchiefed women and whiskered men are soulful and hopeful and faithful and proud. That rabbi later tells the people of Anatevka, who are reeling from an eviction order and wondering when the Messiah will come, “We’ll have to wait for him someplace else.” And that somewhere else, America, is where the title character of another Jewish musical, playing just across town, is also awaiting her destiny. In the National Yiddish Theatre Folksbiene’s happy-making production of Joseph Rumshinsky’s 1923 operetta Di goldene kale (The Golden Bride), expertly restored by retired Harvard musicologist Michael Ochs, the newly wealthy Goldele sails across the Atlantic from her Russian shtetl to seek her long-lost mother and the first eligible bachelor who can help her do so. Di goldene kale is the first production in the NYTF’s new home, the Museum of Jewish Heritage, which is situated in “Manhattan’s South Pole,” as one NYTF employee told me. On account of its supposed remoteness, the company has arranged for a free shuttle bus to take the weather-wary from Midtown directly to the theater in Battery Park. As soon as Fiddler let out from its matinée performance, I ran the few blocks to meet the bus in Columbus Circle. The wind whipped clean my wetted face, and I was ready for the next panorama of lively yidn. I would not have to wait for the next curtain to find it. Awaiting the shuttle, a group of fellow travelers ran this way and that seeking its whereabouts. One woman in a sable shapka boarded a strange bus to ask the driver, “Are you the Golden Bride?” He was speechless. I was delighted by the metaphoric poetry of it all. Just as Fiddler’s townspeople were making their journey to the goldene medine, we were making ours to the Goldene kale, which is the sort of entertainment Tevye and family might have enjoyed when they finally settled in America. High above us, as we waited for the conveyance to take us there, the statue of Columbus gazed toward the New World. And as we sat in the Museum’s café after the Kale, having enjoyed a play written entirely by immigrants, we could see across the harbor to the glittering torch of the Statue of Liberty. It was all rather too good to be true. So was the show. The lovely choristers—who are not Yiddish speakers, but clearly rehearsed with enough commitment to hold forth in a believable stage Yiddish (a specific dialect)—blaze onto the shtetl square in the opening scene, imploring us, “Freyt akh, kinder!” (Be merry, children!). This time, I obeyed. Much is often made of theater pieces being “timeless.” Verbal acrobatics are attempted to demonstrate a play’s “relevance” to our own times. The very skilled co-directors of Di goldene kale, Bryna Wasserman and Motl Didner, use both words in their program note. And yes, a fine, funny operetta like this one is timeless in the way that all plays are, as long as they can continue to make us laugh, cry, and wonder. But Di goldene kale is also not “timeless.” It is quite specific to its time, precisely targeted to a generation of Jewish immigrants in the Lower East Side both amazed and perplexed by their new home in America. Its music goes consistently rum-pum-pum in the pit, and all warbly and romantic in the silver tones of the singers, led with great panache by conductor Zalmen Mlotek. “Tra-la-la”s abound. One woman (robustly funny Lisa Fishman as the innkeeper Toybe), proud of her Yankee attire, boasts of herself in her newly acquired English, “Will you look at she!” to which her husband (charming Bruce Rebold as Pinchas) replies, “You look like a regular beef roast!” A song is sung in earnest praise of Soviet Russia. One awkward suitor’s running gag is that he is quite deaf and must use an ear-trumpet. A fellow manages to perfectly conceal his identity from the woman who has loved him for years by donning a tiny mask then dancing a kazatzka to mystify her. Yes, it is dated, and deliciously so! For the datedness is presented with such love, color, and joy. The yellow tresses of Jillian Gottlieb (as the sprightly second banana Khanele) shine like teygelekh and her comically deployed voice is sweet to match. Rachel Policar could do more to distinguish her character, the titular bride, but the feeling heart cannot help but thrill to her music, which she delivers yearningly and tenderly. Cameron Johnson as her idealistic boyfriend Misha sings to his beloveds (Goldele, and Mother Russia) with appealing ardor. Fiddler was written with the hindsight of devastation, coming only twenty years after the Holocaust. It is plain to see why the show is suffused with melancholy throughout. Di goldene kale was written with no such hindsight. It was made to enchant a people on the cusp of what they thought would be a new golden era, in a new golden land. While at Fiddler I could not stop crying, at Di goldene kale I, and my friend beside me, could not stop giggling. It was such a thing of gaiety that she pronounced it at the curtain, “the dancing-est thing I ever saw.” The show was compelling her to speak like a Vaudevillian! Bertha Kalich (1874-1939), a Galician-born actress of the New York Yiddish stage, is quoted by Nahma Sandrow in her book Vagabond Stars: A World History of Yiddish Theater: “‘The American in the theater is virtually dragged along against his will,’ but the Yiddish fan, ‘works with the actor or the author.’” At the performances this week, the roles were reversed. The very diverse Fiddler audience, with its humming-along and its finishing lines betimes, acted like more of a traditionally emotive, responsive Yiddish theater audience than the patrons of Di goldene kale, who were watching a play performed by a Yiddish theater and were sometimes as silent as if in a museum (which, after all, they were). The Folksbiene need not stop at bringing new life to old works. It might revivify a whole ethic of enjoying a play, by inspiring its patrons to not merely take the play in, but to give out a like energy—to be not merely an audience at a Yiddish theater, but rather a Yiddish theater audience! The crowd at Di goldene kale was finally activated at the curtain call, with a sing-along to the show’s best tune, “Mayn goldele.” We followed the Yiddish lyrics displayed on the supertitle screen, bumblingly but blissfully. Good, let people feel they understand the motivations and national character of Jews through the plaintive, unparalleled Fiddler. But let them come downtown and know us, too, by the fun and froth of our Second Avenue tradition. For this Christmas season, at a splendid show in the shadow of Lady Liberty, you may see even the Jews being very merry. 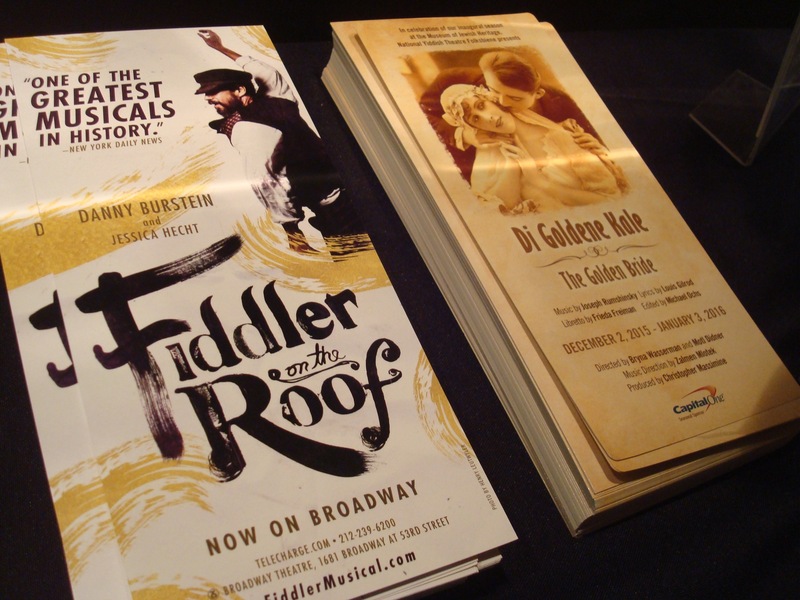 Di goldene kale is playing at the Museum of Jewish Heritage through January 3, and Fiddler on the Roof runs through July 3 at the Broadway Theatre. Yashinsky, Michael. “Di goldene kale and Fiddler on the Roof, from Broadway to Battery Park.” In geveb, December 2015: https://ingeveb.org/blog/di-goldene-kale-and-fiddler-on-the-roof-from-broadway-to-battery-park. Yashinsky, Michael. 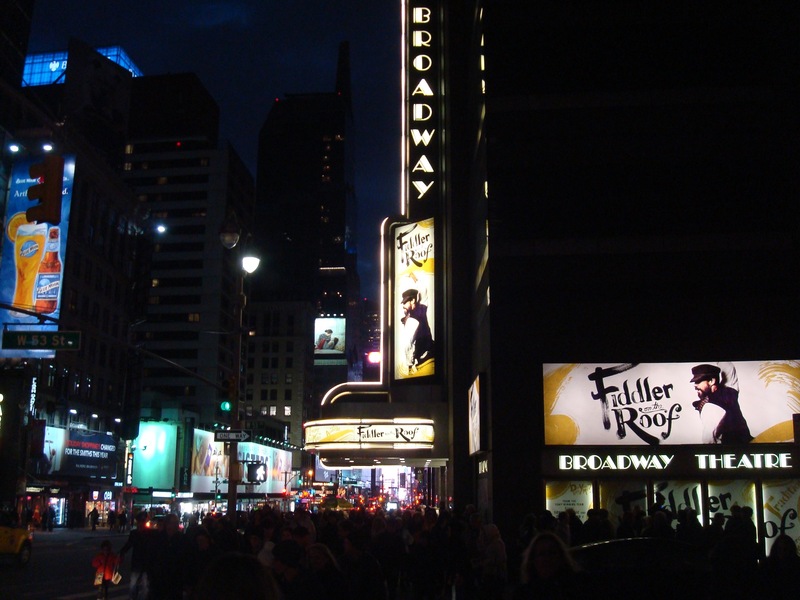 “Di goldene kale and Fiddler on the Roof, from Broadway to Battery Park.” In geveb (December 2015): Accessed Apr 22, 2019. Michael Yashinsky is a Fellow at the Yiddish Book Center in Amherst, MA. For the first time in forty years, Death of a Salesman is being staged in Yiddish, and it’s as relevant as ever.